It's been a pretty long while between updates. I'm sorry about that! Life's been... hectic. 2018 was Honey Crab's slowest year by a country mile, but it was a VERY eventful year for me in other ways. Like, for instance, my name's Rebecca now. Fun, huh? Regardless, it's been long enough that I should definitely turn this unofficial hiatus into an official one. Don't worry! I want to get back on track soon, but I'd like to get some ducks in a row first. I'm working hard on updating the website to display better for more types of users (ESPECIALLY on mobile), fixing errors, and updating the backend to make it easier for me to assemble and post pages. I'll also be making some adjustments to existing pages, like adding panel gutters across the board and making various lil nitpicky art/audio fixes. Did you know Lifeguard Keith's shirt is a violation of the Geneva Convention? WHOOPS. White cross on red is good, red cross on white is apparently NOT so good. Once that's all done to my satisfaction, I want to dive back into telling this story. I say this a lot, but I really appreciate your patience! Well, that took a little longer than expected. I decided this past summer that I was going to try something extremely ambitious with page 20. Honey Crab has dabbled in frame-by-frame animation before, but a fully animated scene was something else entirely. I had a feeling I might be biting off more than I could chew, and I was kind of right-- to the point where this will probably not be a regular thing for the comic. But as someone without prior experience or training in this type of animation, I'm pretty happy with the results and happy to have done it. Today marks one year since the comic launched! I've learned a lot of new tricks since then, and I'm ready to dive into year two. Regular updates should be back on the menu shortly. After a long summer of programming, design, and discovery, Honey Crab is finally ready for the limelight. It's a fantasy story set among the stars, where the mundane collides with the surreal, and where adventure welcomes the brash and bold! This is a story that I've been excited to share for so long that I'm still a little amazed it's finally taking shape! The best place to start is right here. I hope you're good with names! The comic is designed to be readable on most devices, and there are a few options available for those who want or need a simplified reading experience. Sounds and animations can be switched on or off at will, and you can even switch entirely to "No-Frills Mode" for a simple scrolling version of the comic. Honey Crab is absolutely free to read, but if you enjoy what you see so far, I hope you'll help support the comic! 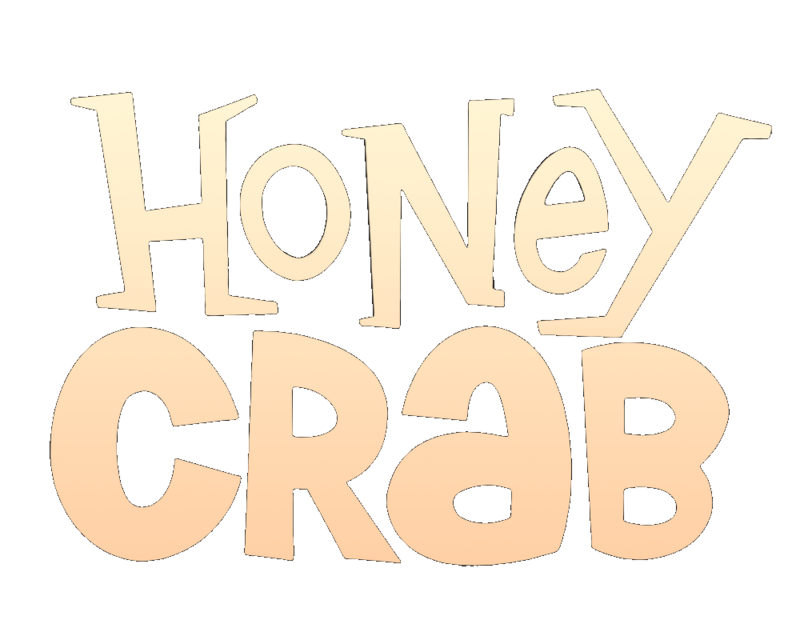 You can back Honey Crab on Patreon, pledging to donate an amount of your choosing for each page that gets posted. You can also check out the comic's Teepublic store, which will be updated periodically with shirts and art prints. The first shirt, available today, features Honey's favourite heroine! Every bit of financial support, large or small, makes it easier for me to dedicate time and effort toward creating the best comic I can. Thanks for reading, and I hope you'll enjoy what's coming next!